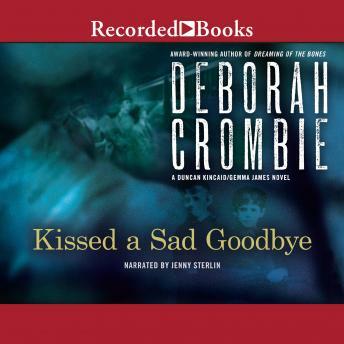 Reminiscent of Ruth Rendell, multiple award-winning author Deborah Crombie creates graceful mysteries, resonating with lyrical prose, elegant suspense, and finely-drawn characters. This is her darkly irresistible tale of friendship shattered by shocking betrayal, and repercussions that echo down through the years. A stunningly beautiful young woman is found strangled in London's Mudchute Park, her clothing carefully arranged to preserve her modesty. With that unusual detail in mind, Detective Superintendent Duncan Kincaid and his partner Sergeant Gemma James suspect the crime was more than a simple assault gone awry. As they collect the strange facts surrounding her death, they discover the victim's life was a mystery even to those who knew her best. Internationally-acclaimed author Deborah Crombie brilliantly weaves together events of World War II England with complex problems of present-day London. As British actor Jenny Sterlin's superb dramatization unfolds, you'll understand why this crime novel is as at home on the bookshelf with literary novels as it is with the most baffling whodunit.